The post Where Hawaii Renters Spend Half Their Incomes On Housing appeared first on Honolulu Civil Beat. If you live in Hawaii and don’t own a home, chances are you spend a huge percentage of your income on rent. 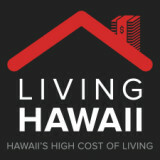 Most renters in Hawaii spend 30% or more of their incomes on housing. But it’s a much bigger cut of their paycheck in many communities. Hawaii renters spend, on average, at least half of their incomes on housing in nearly 10% of the state’s census block groups. On Oahu, that includes parts of the North Shore, Waianae and Kalihi. The list also includes pricey neighborhoods like Aina Haina, where residents tend to have relatively high incomes but available rentals can be very expensive. In just under half of the state’s census blocks, renters on average spend 30% to 49% of their income paying the landlord. Renters are considered cost-burdened if they spend 30 to 49% of their incomes on rent, and severely cost-burdened if they spend at least 50% of their incomes on rent. The U.S. Department of Housing and Urban Development considers affordable rent to be less than 30% of median household income — on Oahu, that was $88,000 for a family of four in 2017. To see the legend for the map, click the arrow in the top left. Zeros indicate that the data is suppressed to protect confidentiality because there are too few renters in the area. Andrew Aurand, vice president of research at the National Low Income Housing Coalition, says that Hawaii is similar to the rest of the nation in having a significant shortage of affordable units for very low-income renters. In one block group on Oahu’s North Shore between Haleiwa and Waimea Bay, residents have a median income of $94,286. But those who rent, on average, still spend half their incomes on housing. One factor affecting the housing market is the presence of so many vacation rentals. More than one in every four homes on Oahu’s North Shore is taken out of the housing stock and being used as a tourist rental, according to a study by the Hawaii Tourism Authority. Even residents in pricey East Honolulu are burdened by high rents. In parts of Hawaii Kai, where the median household income is $102,228, renters still struggle and, on average, report spending at least 50% of their income on a rental. Aurand says the fact that higher income families pay so much of their salaries in rent makes Honolulu similar to cities like Santa Barbara, Los Angeles and San Francisco. Often rents and incomes fluctuate within neighborhoods. 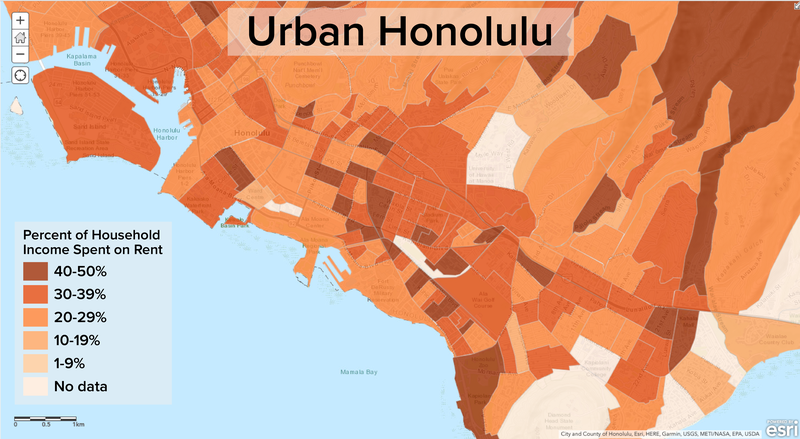 In urban Honolulu, high-income and low-income residents can be found within just a few blocks. One stretch of Halekauwila Street in Kakaako that’s home to low-income rentals and senior housing has a median household income of $22,194 and a median rent of $902. Renters there spend an average 47% of their incomes on housing. Just a block away, the median household income is $91,560 and the median rent is $2,702. Those who don’t own homes spend 33% of their incomes to rent units, perhaps in the new luxury towers that have sprung up in the area. 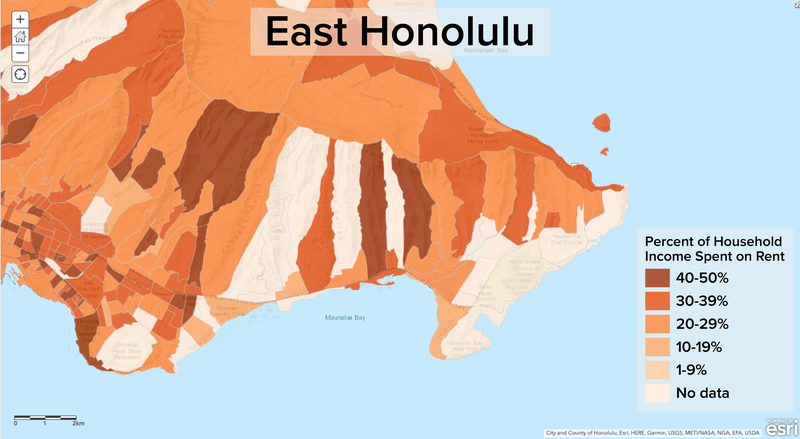 Like most other parts of the U.S., Hawaii still struggles with providing enough affordable housing to people at the lower end of the income spectrum. 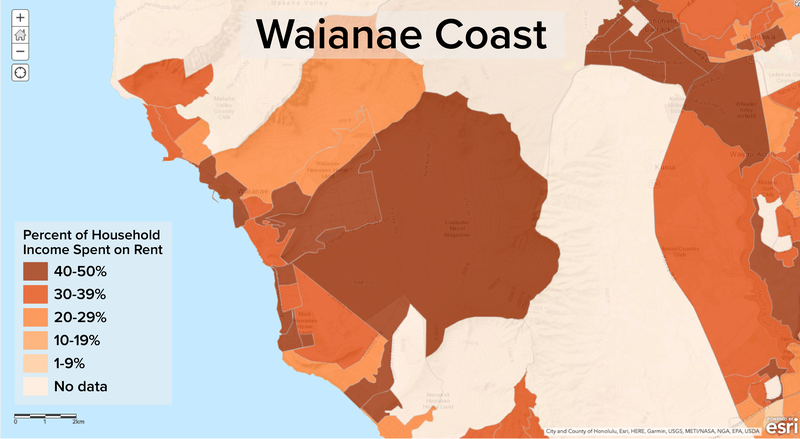 In parts of Waianae, the median rent is $1,045 but the median income is $25,665. Even though rent is much cheaper than many other parts of the state, the median rental cost of $1,045 and still takes up half of renters’ household incomes. Aurand says that for low-income families, spending more than half your income on housing means you have less to spend on other necessities like food, transportation and medical care. That can have generational impacts. “Poor children perform better on cognitive tests if they’re living in affordable homes than children who are living in cost-burdened homes,” he says. The same challenge exists in west Molokai where the median income is $27,639. The median rent is just $753 but renters still use 43% of their incomes to cover housing. Hawaii’s neighbor islands reflect the state’s affordability challenges across income ranges. 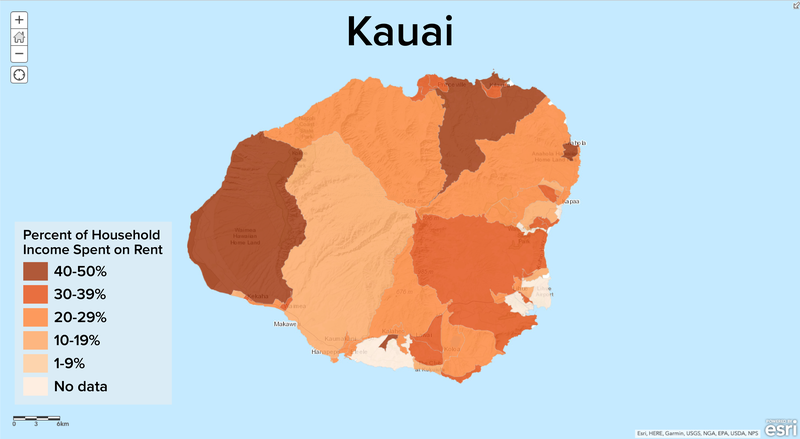 In west Maui, the household median income is $106,250. But with average median rents of $2,447, those who rent spend 44% of their income on $2,447 median rents. Along the southern shore of Hawaii Island, households earn a median income $48,191. Median rents, meanwhile, are $1,496. 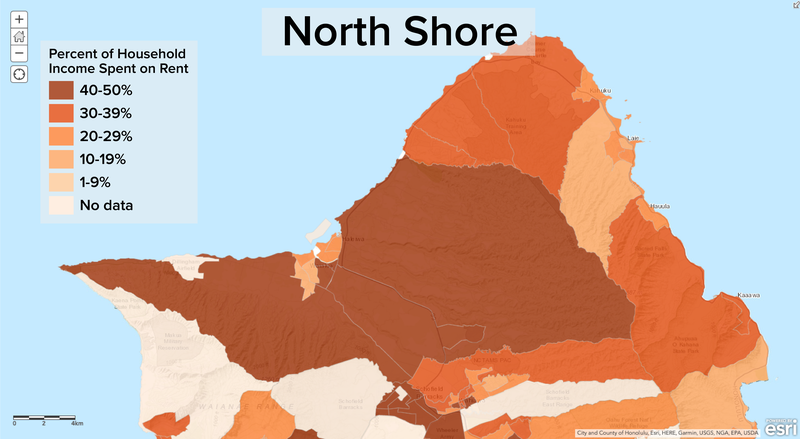 On the north shore of Kauai, the median household income is more than $100,000. But renters spend an average of more than 40% of their incomes on housing. Civil Beat used census estimates from the 2013-17 American Community Survey, obtained via the National Historical Geographic Information System, to create an interactive map showing median gross rent as a percentage of household income by census block group, which includes about 600 to 3,000 people. The map shows the block groups where renters spend a bigger percentage of their incomes on rent, as well as the median gross rent in the area and the median household income for all residents in the area as of 2017. The post Waters Defeats Ozawa In Honolulu City Council Rematch appeared first on Honolulu Civil Beat. The marathon campaign to represent East Honolulu on the City Council ended Saturday night with Tommy Waters defeating Trevor Ozawa by 51.4% to 48.5% in a special election conducted mostly by mail. Waters got 17,491 votes to Ozawa’s 16,487. The longtime political rivals went into overtime to settle the matter after the Hawaii Supreme Court invalidated the November election results, which showed Ozawa winning by just 22 votes. The court ruled that some late ballots had been improperly counted, and the city enlisted two state election observers Saturday to ensure that wouldn’t happen again. Waters’ victory is expected to prompt the City Council to shuffle its leadership. Ozawa has 20 days to contest the results, council members say. Waters took in the results with about 100 supporters at The Brilliant Ox restaurant at Ala Moana Center, where the crowd erupted in cheers and chants of “Tommy, Tommy” as the results were announced. Ozawa was ensconced in a more private setting with supporters at Roy’s Hawaii Kai. Tommy Waters hugs his son, Kai, and daughter, Emma, after the results were announced. Waters said he’s looking forward to tackling the problem of homelessness, Hawaii’s cost of living and trying to fix problems with rail. 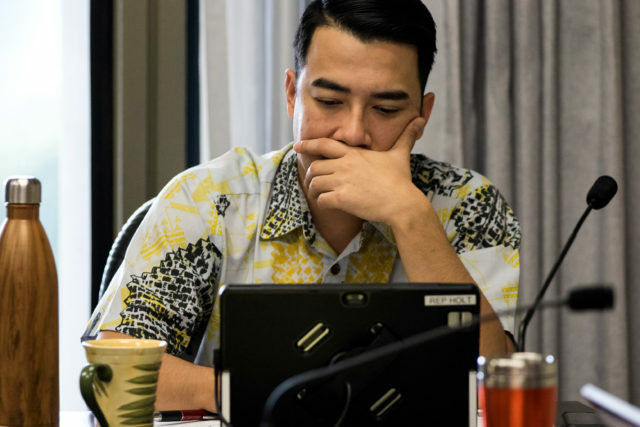 Ozawa was originally elected to represent Council District 4, which stretches from Hawaii Kai to Kewalo Basin, in 2014, when he beat Waters by 41 votes. Since January, District 4 has been served by interim council member Mike Formby, who will retain the position until the results are certified. The Supreme Court decision blocked Ozawa from not only getting sworn in, but also from becoming the City Council chairman. In January, Ozawa was on the cusp of replacing Ernie Martin, his political ally who left office in December, as head of the council. Ozawa’s leadership was supported by fellow council members Carol Fukunaga, Ann Kobayashi and Kymberly Pine. Instead, Kobayashi became the interim chair and presiding officer. 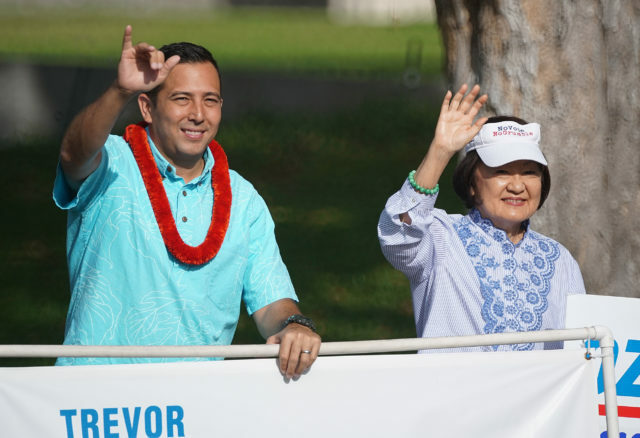 Trevor Ozawa was joined by his political ally, Councilwoman Ann Kobayashi, for last-minute sign-waving Saturday morning at Beretania and Punchbowl streets. Just a few feet away, Tommy Waters was sign-waving as well. Political observers suspect the Waters victory will shift the balance of power toward supporters of Mayor Kirk Caldwell. 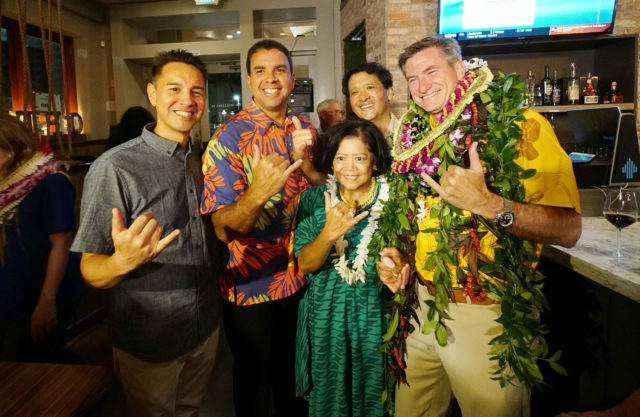 Waters was backed by Caldwell and council members Ikaika Anderson and Joey Manahan, both of whom were at Water’s party Saturday night along with Councilman Ron Menor. The nine-member Council also includes Heidi Tsuneyoshi, who previously worked for Martin; Brandon Elefante, a longtime Caldwell supporter; and Menor, who has also often been allied with the mayor on issues like affordable housing policy. Ozawa clashed repeatedly with Caldwell while in office on topics such as the funding of Honolulu’s massive rail project. Tommy Waters, right, with council members, from left, Joey Manahan, Ikaika Anderson and Ron Menor at The Brilliant Ox restaurant awaiting special election results. With them is Paulyne Anakalea, Anderson’s executive secretary. As he celebrated his victory, Waters was asked how he’ll work with other council members and the mayor: “We can agree to disagree, but we don’t have to be disagreeable,” he said. Manahan said he was glad Waters won and happy the Supreme Court gave him a second shot at the council seat. He said Waters could help foster better discussions on some of the issues the council is facing. The special election campaign between Ozawa and Waters got ugly as both candidates accused each other of lying to voters. Ozawa’s campaign included misleading mailers and questionable advertisements, while Waters’ got most of the deep-pocketed contributors. Waters reported raising $289,168 from January to March — $97,000 more than Ozawa. Unions backing Waters reported raising another $170,000 during the same period. Ozawa alleged three of the Supreme Court justices who invalidated the November result were biased in favor of Waters due to his former role on the judicial selection committee. Ozawa thanked his supporters and his family and said he still wants to work for his community, but didn’t say in what capacity. Waters and Ozawa have been linked by ultra-close election results for so long that it seemed appropriate that they ended up almost next to each other Saturday morning as they waved at passing motorists for hours at Beretania and Punchbowl streets. 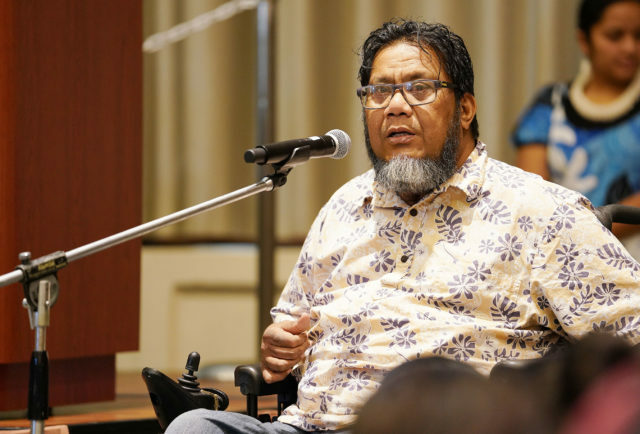 The post Hawaii Loses Leading Civil Rights Advocate Joakim ‘Jojo’ Peter appeared first on Honolulu Civil Beat. Joakim “Jojo” Peter grew up on an island that was home to about 500 people and had no electricity, spending his childhood fishing with his grandfather and listening to stories about his family history. Years later, Peter became an author and a champion for social justice in Honolulu whose influence spanned the Pacific Ocean. Peter died Monday in Honolulu. He was 54. Peter dedicated his life to advocating for the rights of immigrants and people with disabilities. He was an educator, scholar and community organizer known for his hard work and humility. In Hawaii, he fought negative stereotypes about Micronesians and advocated for equal access to health care. Joakim “Jojo” Peter from Chuuk encouraged students at the 2018 Micronesian Youth Summit to have pride in themselves and in their culture. He was also a former radio disc jockey with a great sense of humor who loved coffee and Zippy’s. “Leave a message, or sing a song,” his voicemail greeting said. He attended Xavier High School, a Jesuit school in Weno, Chuuk. He earned a bachelor’s degree from the University of Guam, two master’s degrees in history and Pacific Island studies and a doctorate from the University of Hawaii in special education. Along the way, he inspired a generation of Pacific Island scholars and spent 15 years working at the College of Micronesia. Peter co-founded numerous organizations to help the Micronesian community in Hawaii and beyond, including the one-stop center We Are Oceania; COFA-CAN, a local advocacy group; and COFA-CLAN, a national advocacy group. Most recently he worked at the educational nonprofit Pacific Resources for Education and Learning helping Micronesian families understand their rights. Citizens of Palau, the Marshall Islands and the Federated States of Micronesia come to Hawaii through an agreement known as the Compact of Free Association, or COFA, which allows them to live and work freely in the U.S. and gives the U.S. military control over the Pacific nations’ airspace, land and surrounding waters. But despite being long-term legal residents, COFA migrants lack access to many safety net programs including Medicaid, food stamps and federal disaster assistance. With his appointment to the Hawaii Civil Rights Commission, Peter became the first citizen of a COFA nation to serve on any Hawaii state board or commission. Jojo Peter helped others from Micronesia enroll in health insurance in 2015 in Kalihi. Peter’s nomination by Gov. 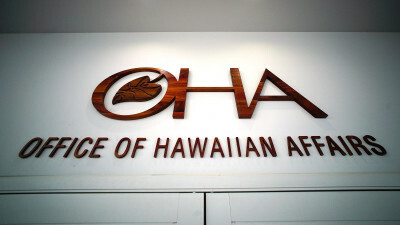 David Ige prompted the Legislature to amend the law that by omission barred COFA citizens from serving on boards or commissions. “Jojo Peter was a valuable member of the Hawaii Civil Rights Commission, and he will be missed,” Ige said through a spokeswoman Wednesday. The governor plans to appoint another person to take Peter’s place on the commission, but many say his death creates a void that won’t be easily filled. 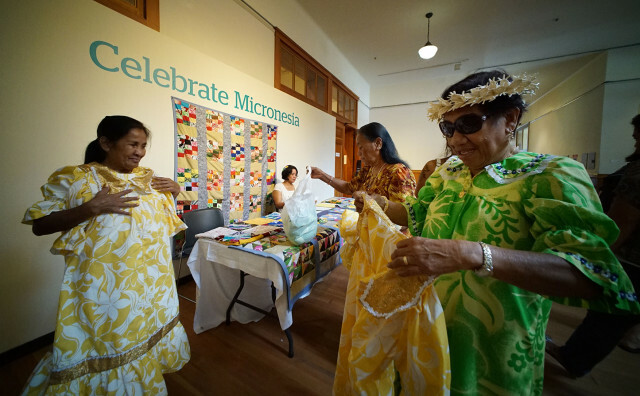 “He has been the voice for Micronesians out here in Hawaii,” she said. Larry Reigetal, a master navigator from Lamotrek, Yap who lives on Guam, says that now that Peter has passed into the realm of their ancestors, their shared cultural traditions dictate his name shouldn’t be spoken, let alone shared with the outside world. Reigetal was one of Peter’s high school classmates and says speaking about Peter honors him by furthering his lifelong battle for social justice. Mary Hattori remembers the day when she nearly quit pursuing her doctoral degree. She walked out of a classroom and ran into Peter, who persuaded her not to give up. “We need more Pacific Islanders, more Micronesians with advanced degrees,” she remembers him saying. Hattori went on to become a professor at Chaminade University. She worked with Peter to give talks at local high schools to inspire Micronesians and collaborated with him on the annual Micronesian Festival. He was supposed to emcee the May 11 festival at Bishop Museum. Peter was an emcee at past Micronesian festivals, and was scheduled to do it again this year. Hattori says Peter was driven to help those less fortunate than him. Peter’s doctoral dissertation recounted the struggles of Chuukese families who sought health care in Hawaii for their disabled children. Hattori says she is among a generation of scholars inspired by Peter. James Viernes from the University of Hawaii’s Center for Pacific Island Studies is another. He says Peter had an ability to bridge cultural differences and garner respect both in Micronesia and in the U.S.
Peter’s death has resonated on the mainland as well. Joe Enlet, the consulate general for the Federated States of Micronesia in Portland, says he and organizers in Hawaii, Oregon, Texas, California, Arizona and Arkansas almost cancelled their COFA-CLAN meeting this week but decided the best way to honor Peter would be to continue. “It’s just so difficult to put into words the depth of his influence on people who are advocating and people who care about Micronesia and the Pacific Islands as a whole,” Enlet said. Peter spent his last weekend speaking at Civil Beat’s #BeingMicronesian event at the Honolulu Biennial, where he discussed militarism and colonialism in the Pacific. 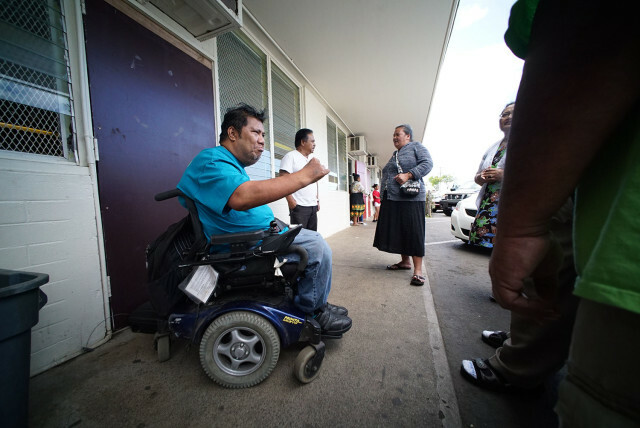 He would take TheBus from his home in the Mayor Wright public housing complex to homeless shelters to help Micronesians ineligible for Medicaid sign up for health insurance. Sometimes that meant waiting until there was an accessible seat available on the bus. According to Peter’s friends, those dreams included writing a book about Micronesian history told from the perspective of Micronesians; establishing a Micronesian charter school in Hawaii; going fishing on the reef in the Mortlock Islands; and spending one more night sleeping on the sand in Etal under the stars. The post OHA Presses For A Bigger Share Of Money From Hawaii’s Trust Lands appeared first on Honolulu Civil Beat. 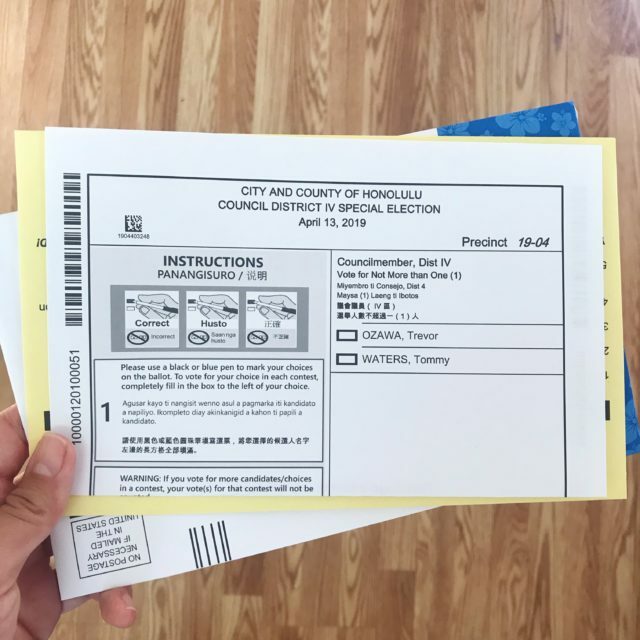 The post Over 30,000 Have Voted In Special Election For City Council appeared first on Honolulu Civil Beat. Over 30,000 people had voted as of Tuesday in the special City Council District 4 election between Trevor Ozawa and Tommy Waters to represent East Honolulu. That’s more ballots cast than for any other special election in the county’s history, said city elections spokesman Rex Quidilla. It’s also approaching the 36,694 voters who cast ballots for Ozawa and Waters in last November’s election. Honolulu’s elections office mailed about 63,000 ballots to voters in City Council District 4. Ozawa outpolled Waters by 22 votes, but the Hawaii Supreme Court invalidated the election, ruling that election officials counted mail ballots that arrived too late. City election officials plan to avoid that problem by picking up the last batch of mail ballots from the post office at 5:30 p.m. Saturday. Quidilla says that the elections office will enlist two state election officials to confirm that the pickup occurs before 6 p.m.
Mail-in ballots were sent to 63,000 voters. As of Tuesday evening, Honolulu’s elections office had received 29,785 completed ballots. Honolulu Hale is the only designated walk-in polling place and just 301 people had voted in person as of Tuesday. It will be open Wednesday, Thursday and Friday from 8 a.m. to 4 p.m. and Saturday from 7 a.m. until 6 p.m. Final results are expected by about 10 p.m. Saturday, Quidilla said. The race between Ozawa and Waters is for the City Council seat representing an area stretching from Hawaii Kai to Kewalo Basin. Ozawa beat Waters by 41 votes in 2014 and served as a councilman for four years. The race is nonpartisan but has gotten ugly with both candidates accusing the other of misleading voters. Waters has raised far more money than Ozawa this year and is backed by AiKea, the political arm of Unite Here Local 5, a union representing service workers. AiKea raised $170,000 in support of Waters, according to the latest available campaign data. Civil Beat has published Q&A’s for both candidates. Read Ozawa’s by clicking here, and Waters’ by clicking here. The post Survey: 1 in 4 Micronesians Say They Face Prejudice At Work appeared first on Honolulu Civil Beat. The post Waters Leads Ozawa In Money Raised And Spent In City Council Race appeared first on Honolulu Civil Beat. Tommy Waters has raised about $97,000 more in campaign contributions than Trevor Ozawa this year in the special election for Honolulu City Council District 4, which stretches from Hawaii Kai to Waikiki. Waters reported raising $289,168 from Jan. 1 to March 29 after starting the special election period with just $285. He still has $43,487 on hand after spending about $230,000 this year, according to the latest state Campaign Spending Commission figures. Waters has also benefitted from supportive unions. AiKea Unite Here, the political arm of the service workers’ union Unite Here Local 5, raised $170,000 over the last three months. Honolulu City Council District 4. Ozawa has slightly more cash on hand with $44,226. He started the election period with about $28,000 and raised just over $192,000 while spending about $176,000. As the incumbent, Ozawa outspent Waters last fall and outpolled him by 22 votes, but the Hawaii Supreme Court invalidated the results, ruling some late-arriving ballots should not have been counted. The special election is April 13, but voting has already begun at Honolulu Hale. Former city transportation services director Mike Formby is representing District 4 on the City Council until the election is decided. Waters’ biggest contributors were several unions, including those representing ironworkers, painters and carpenters. He also received $4,000 each from Friends of Joey Manahan and Friends of Ikaika Anderson, both current City Council members. State House of Representatives, 2002 - 2008. Other well-known contributors to Waters included Honolulu Police Commissioner Loretta Sheehan, attorney Paul Alston and Tetris millionaire Henk Rodgers. AiKea Unite Here spent more than $100,000 to support Waters over the last three months, including $60,000 on TV and social media advertising. The organization received $50,000 from the Ironworkers for Better Government and $20,000 from the Local 1 Political Action Committee. Ozawa also received big donations from unions, including those representing Honolulu police officers and longshore and warehouse workers. He got $12,000 from executives at Roberts Hawaii, a tour bus company. He also received thousands from executives at Kobayashi Group, Avalon Group, R.M. Towill Corporation, Mistunaga & Associates and other development and construction industry firms. Ozawa said the list of Waters’ campaign donors suggests he will be a rubber stamp to Mayor Kirk Caldwell, a message he’s repeated throughout this campaign. Some of Waters’ donors this year include Caldwell appointees and employees, such as his deputy managing director Georgette Deemer and human resources director Carolee Kubo. In response to Ozawa’s criticism of donations from Caldwell supporters, Waters noted Ozawa’s donors included developers and lobbyists. Waters said the City Council needs “respectful” leadership, a campaign message he has repeated on multiple fliers. Tensions between the two candidates have run high throughout the campaign. Ozawa previously beat Waters by just 41 votes in 2014. The post VIDEO: Micronesians Respond To Racist Tweets appeared first on Honolulu Civil Beat. The post Micronesians In Hawaii Still Struggle To Get Health Care appeared first on Honolulu Civil Beat. The post Panel Narrowly Recommends Keeping William Aila In Hawaiian Home Lands Post appeared first on Honolulu Civil Beat.